After a staggering 19 hours of the new raid being live for Destiny 2 Forsaken, clan Redeem have managed to finish it. As a result of a fireteam of Guardians finishing this raid the game has been altered for everyone with a new Strike opening up. This is something that’s never been seen in Destiny before, and it’s a change that’s being welcomed by the community around the world. Usually it only takes a clan a few hours, around 4 at the most, in order to finish a new raid once it’s released. However, completing Last Wish, which tasks Guardians with finishing off the last Ahamkara, wish granting dragons, has proven a lot more complex and difficult than previous Destiny raids. In total clan Redeem took 18 hours and 48 minutes to finish Last Wish, making it the longest world first for a raid since Vault of Glass. Bungie is offering the 6 Guardians in the fireteam who finished the raid first a wresting belt decorated with the Destiny 2 raid emblem and similar Destiny 2 raid insignias. Those 6 Guardians are; Modern, Sweatcicle, Ehroar, Indica, FleshCrunch, and Gladd. 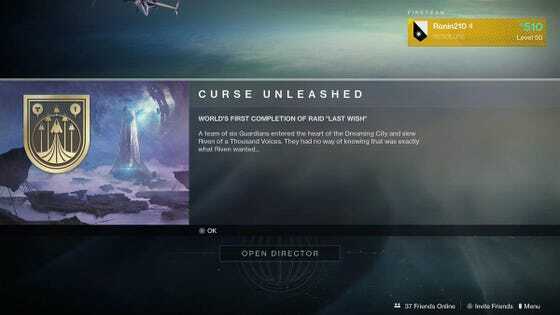 All Destiny 2 players are now receiving the prompt upon entering the game that the raid has been completed. The prompt hints that the end boss of the raid, Riven of a Thousand Voices, wanted to be destroyed. The new Strike and Quest which have been unlocked thanks to this accomplishment are themed around the Taken. It seems as though the Taken have also entered the Dreaming City, which may well be a terrible thing for the area. Guardians are still out searching for ways in which the Dreaming City has been altered by the completion of the Raid, but it seems as though some small changes have already taken place, with more to follow according to Bungie. It’s interesting to see the entire community being affected by the efforts of the fireteam who finished the raid. This is what Bungie were talking about when it comes to the raid changing in ways that have never been expected. What else the game has in store for those who finish the raid multiple times could be very exciting. Next articleHow Different Is Destiny 2 Forsaken Iron Banner? How Good Is Thunderlord In Destiny 2?